It’s a cruel saga, and one that promises no immediate end. Turkey, considered one of the more potent of powers within the NATO alliance, has manoeuvred itself into a play that Washington will find hard to avoid. For Ankara, one thing must not happen as Islamic State forces gradually vanish, or more likely metamorphose into the next force they will, in time, become. It is that inconvenient matter of the Kurds, ever present, and, in recent few years ever forceful, about carving out territory within Syria and Iraq. The United States has seen the Kurds as something of a gem, desperate, keen to fight, and often effective in their encounters with the Islamic State forces and their various incarnations. Ankara has been none too pleased with that fact. Guns, once acquired, are used; weapons, once used, are hard to put down. NATO allies, on this score, do not see eye to eye, and have never done so. These eyes have parted even further with Washington’s promise that a 30,000 Kurdish-led border force will be established to police Turkish-Iraq borders in an effort to quash any resurgence of Islamic State forces. The promise has also managed to irk Iran and Russia, who see such a force as directed, not merely at Islamic State, but against their regional influence. 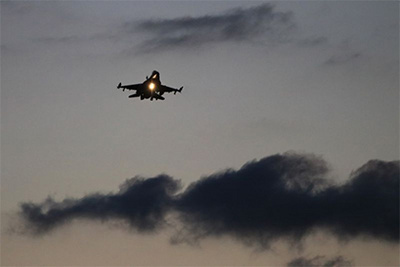 On Saturday, 72 Turkish jets targeted the Kurdish enclave of Afrin in Syria in an effort, codenamed Olive Branch, to remove, what Turkey’s Recep Tayyip Erdoğan called a terrorist threat across northern Syria. “Beginning from the west, step by step, we will annihilate the terror corridor up the Iraqi border.” Within that enclave are some 8 to 10 thousand Kurdish fighters. But added to that are 800 thousand vulnerable civilians, many displaced by the Syrian Civil War. Did it matter that the operation was just another example of Syria’s sovereignty as contingent, best ignored rather than respected by yet another power keen to issue its stamp on the area’s geography? Bekir Bozdağ, Turkey’s deputy prime minister, made a rather weak effort suggesting that such a military venture was temporary, a necessarily surgical move to target an infection. Once achieved, Turkish forces would withdraw. Masks, posturing, and a good deal of dissimulation, are essential across the diplomatic engagement here. The one group that seems to be coming out of this rather poorly are history’s traditional whipping boys, the Kurds, who remain gristle in the broader strategic picture. Russia, for one, has blamed the United States for feeding the unstable situation while urging restraint on the part of Ankara’s forces. “Provocative actions by the US, aimed at isolating regions with predominantly Kurdish population, were the main factors that contributed to the development of a crisis in this part of Syria,” went a statement. Despite adopting a frowning line to the attacks, there is little doubt that discussions would have been had ahead of time with officials in Moscow, given the presence in the Russian capital of Hakan Fidan of Turkey’s National Intelligence Organization and Hulusi Akar, chief of staff of Turkey’s army. Iran, in turn, has been taking the position that such incursions, rather than dousing the fires of terrorist groups, emboldens them. Careful eyes are noting the fortunes of the respective players in this latest, murderous squabble. The attacks were far from negligible, comprising some 100 targets. Another important feature of this muddled equation was the role played by fighters of the Free Syria Army, who also participated in operations against the Kurds. The great power play here, even in the murky bloodiness, is that no one wants a genuinely viable Kurdistan front, and certainly one that has any claim to international legitimacy. One neutralised, weakened, and preferably defanged, is a position that seems to have been reached. Moscow will be assured that future conflict can be averted; Ankara will keep its sword sheathed in future. Washington will be left somewhere in between, left behind in another play it misread. Humanitarian catastrophe will be assured.